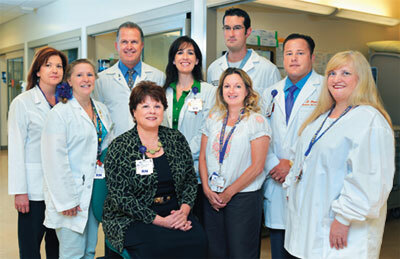 NorthBay’s Trauma Team (left to right): Mary Hernandez, Donna Nayduch, Dr. Pete Zopfi, Kathy Richerson (seated), Heather Venezio, Jackie Nelson, Dr. Seth Kaufman (back row), Daman Mott and Sandy Bauman. Richerson joined NorthBay Healthcare in 2000, knowing that a Trauma Center was on our radar. The former Emergency Department and Intensive Care Unit nurse helped Mercy San Juan qualify as a Level II facility, so she knows the terrain. Her role has been to spearhead the trauma implementation project, and provide the link between administration and Trauma Services. The Vacaville resident earned her bachelor’s and master’s degrees at UC San Francisco. She’s provided the vision and organization and helped NorthBay focus on creating a program that is evidence-based for sound clinical outcomes while remaining fiscally responsible. 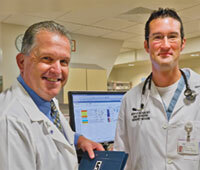 No stranger to Solano County, Dr. Zopfi is happy to step into his role on the trauma team. A general surgeon, he was trained in trauma during his residency in Dayton, Ohio, and now makes Fairfield his home. He’ll be in charge of the trauma surgeon schedule and will perform surgeries, too. He’s in charge of peer review, the quality performance improvement initiatives, medical review of all trauma patients and chairs the Trauma Team’s ongoing meetings. UC San Francisco, and focused on emergency medicine as a resident at the University of Chicago. of emergency and trauma nursing. The trauma program director’s job is to implement policies and procedures and track education, review trauma cases, ensure the registry data is accurate, and follow the trauma patient from Emergency Department through post discharge and rehabilitation, coordinating the span of caring for trauma patients. Prior to accepting the director position in February, Venezio was clinical lead nurse in the VacaValley Emergency Department. The Vacaville resident received her bachelor’s degree in nursing from the University of Louisiana and has a master’s from Virginia Tech. She gained extensive experience in trauma as a nurse at a Level II Trauma Emergency Department at Lafayette General Medical Center in Louisiana. She is an instructor for advanced trauma care for nurses through the UC Davis Medical Center Trauma Department and a national speaker for the Emergency Nurses Association. consultant and author who has been retained to provide oversight and insight into the details of the framework of the trauma system, both internally and externally, and to serve as a mentor to the trauma program’s leadership. Nayduch has filled roles as regional trauma director, acute care nurse practitioner, trauma nurse coordinator and clinical associate at hospitals and medical centers in Colorado, Virginia and North Carolina. New to NorthBay Healthcare, Bauman brings a host of trauma experience. In Pennsylvania, she was unit manager for the Emergency Department of Ephrata Community Hospital and served as an assistant nurse manager for the Reading Hospital and Medical Center’s Emergency Department and held leadership roles in the Pennsylvania emergency nurses association. At NorthBay, the new Fairfield resident will be responsible for the daily clinical and administration operations of the Emergency Department. With data entry as her specialty, Nelson has to populate the registry, filling in more than 200 data points for every trauma patient who is treated at our facility. At NorthBay, the Vacaville resident has held positions of clinic access specialist, quality assurance specialist and supervisor-patient access before taking this data analyst role with clinic infomatics. Hernandez is in charge of the clinical educational aspects of the Chest Pain Center and STEMI (major heart attack) program and acts as the Emergency Department liaison to the other clinical departments that these programs touch. Hernandez, who earned her bachelor’s in nursing from Sacramento State University and a master’s in science of nursing in healthcare education from University of Phoenix, has been with NorthBay Healthcare for the past 10 years, working as a nurse in the Emergency Department, and was night shift team lead for five years. 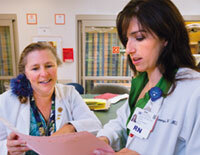 She accepted the role as Chest Pain Center Clinical Practice Manager two years ago. She is instrumental in the development and delivery of staff education for all of our specialty programs in the Emergency Department, including trauma.